AVI and MP4 both are very well-known video formats. At times, people aren’t able to play AVI on their devices, so they may need to convert AVI to MP4 as MP4 file is widely supported by most of the video players, and it’s also the default supported format in Android and iOS devices, therefore it’s far more popular than AVI today. There are many ways available to convert AVI to MP4 online and offline but today we will introduce 2 best ways which can help you more when you are trying to convert these formats. KeepVid Online Video Converter is actually an online website where you can convert the videos by uploading the videos from your computer to the website for conversion. When you’re using this website to convert videos, you don’t have to install any other third-party software on your computer. You just need to browse the website in your browser and then you can convert AVI to MP4 without any effort. When the conversion finishes, you’re able to get the converted files in your computer with several helpful ways. KeepVid Video Converter is a desktop program for Windows and Mac computers. Besides the converting feature, this program also gives you editing and downloading features, which are also very helpful in our daily life.  Therefore, KeepVid Video Converter is an all-in-one solution for all video needs. 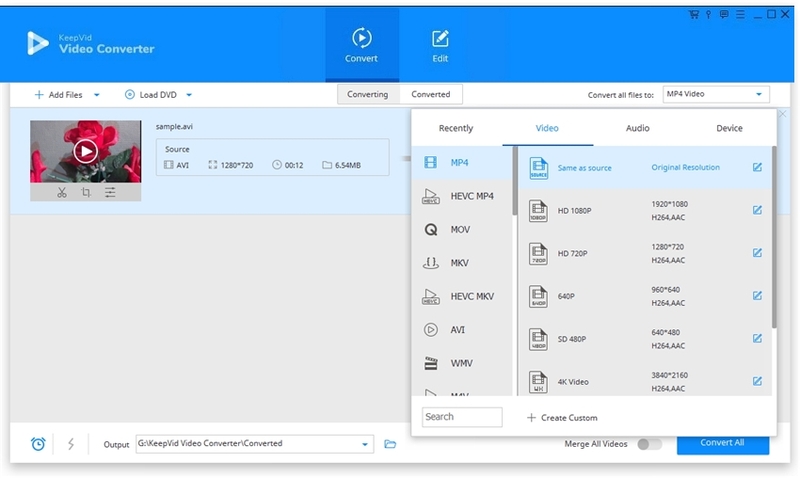 KeepVid Video Converter has a very easy-to-use interface, and it provides a free trial. In this part, we’re going to introduce how to use this video converter program to convert AVI to MP4. Besides converting AVi to MP4, KeepVid Video Converter also enables you to convert MP4 to AVI with ease. 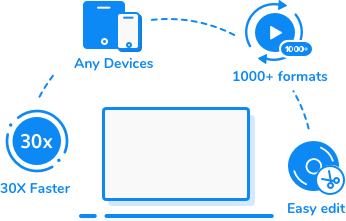 Convert multimedia files to more than 1000 video and audio files. It has a High-Speed conversion feature that enables you to convert videos with 30x faster speed. Step 1. 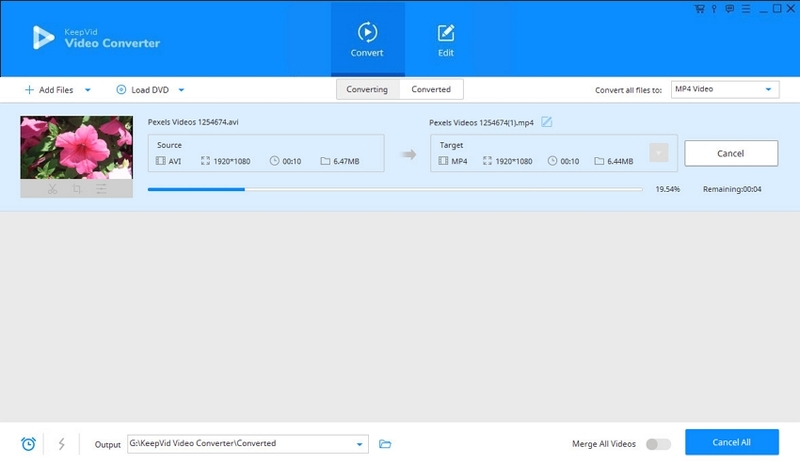 Start KeepVid Video Converter and add AVI file from your computer. Step 2. Choose MP4 as an output and click the Convert button. Step 3. When the conversion finishes, you’ll get the converted file in Converted tab. Download and install KeepVid Video Converter on your computer, then start it. Now choose the Convert section at the top middle of the main interface. Click the Add File or Add Folder button at the upper left corner of the main interface, and add the AVI file from your computer. You are also allowed to upload files to the program by dragging and dropping the video into program window directly. Now the program will show you the detailed information of this file. You can click the inverted triangle icon at the right side of the Target area, and select MP4 as an output in the pop-up window. Or you can click the inverted triangle beside the Convert all files to button, and choose MP4 as an output. After that, click the Convert or Convert All button to start converting AVI to MP4 videos. 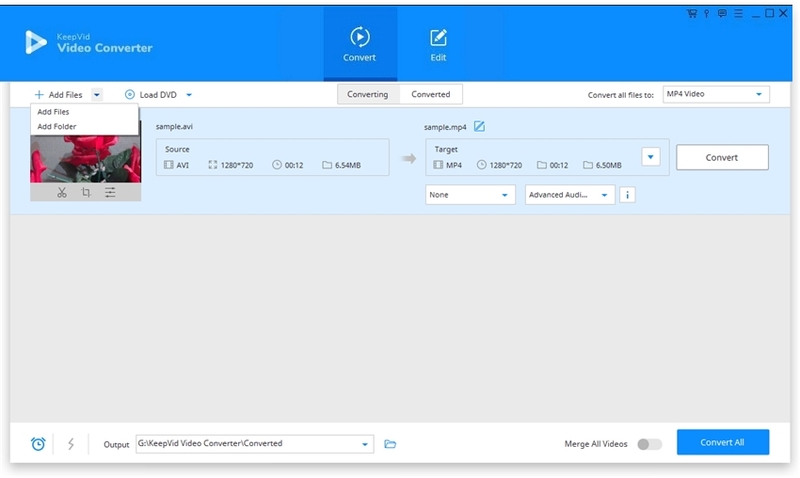 When the conversion starts, KeepVid Video Converter will show you the converting process. After the AVI to MP4 conversion, you can get the converted files in Converted tab. You can also right-click the converted file and choose Open File Location to find the converted files in your computer. MP4 format is also known as MPEG 4 format. This format is a container format and used to store video and audio files in a single container. Including audio and video this format can also be used to store other types of data such as images and subtitles. This format works just like other format and used to play videos over internet as well.